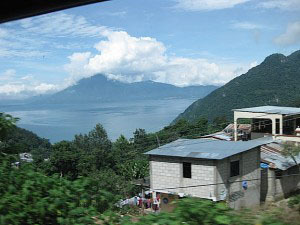 Houses of local residents at Lake Atitlán. I’ve been ruminating a lot on globalization. I don’t know much about the political and economic forces at play, although I’m learning more every day. But, I’ve been thinking about globalization and its effect on communities, and I can certainly see some of the changes that have taken place in Guatemala. This has set me wondering about the positive and negative effects globalization can have. There is a lot of foreign money in Guatemala. There are now a lot of foreigners moving here because of the low cost of living. 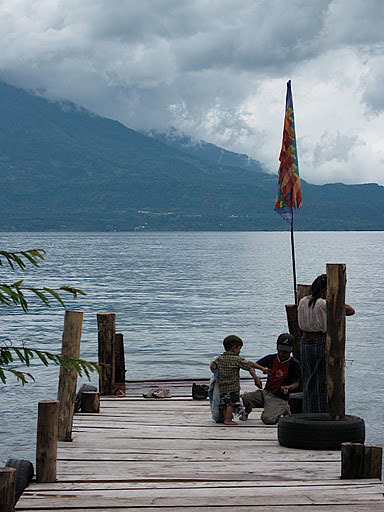 I spent a few days this week at Lake Atitlán and was taken aback at how much affluence I saw there. Three-storey mansions preside over the hillsides. Men and women in indigenous clothing ride the lanchas (small motor boats) from Panajachel and San Pedro to the private muelles (docks) to work in the mansions every day. The foreigners often employ these women and men to do housework, construction and other jobs. Often, these workers have a low level of education. However, this drives up wages, and can often also improve working conditions dramatically. Foreigners often treat their workers by the accepted standards of their country of origin, which can force local employers to abide by the same higher standards and wages. 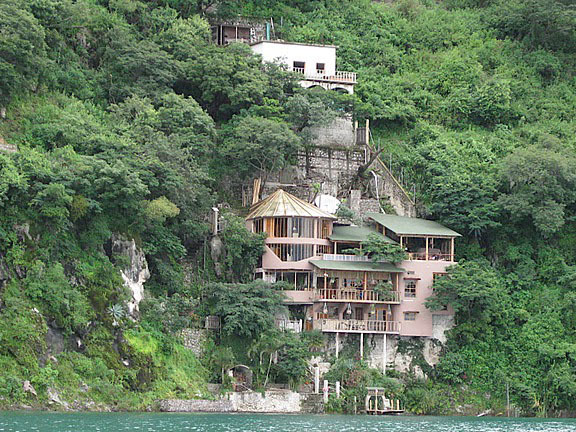 Houses of foreign residents at Lake Atitlán. In addition, a number of American and European companies either own or use call centers in Guatemala, which has become one of the fastest-growing areas of the Guatemalan economy. Guatemala attracts this business because of a number of factors: proximity to the U.S., lower costs as compared to the rest of Central America, the relatively high quality of its IT infrastructure, government effort to promote English education and a neutral accent (it’s like the Nebraska of the Spanish-speaking world). Work in call centers is one of the few attainable jobs outside of manufacturing or agricultural work, so has a heavy draw for workers as well. The sector is receiving so much importance in Guatemala, in fact, that the Instituto Guatemalteco Americano (Guatemalan American Institute), a well-known English language learning institution in Guatemala City, tailors classes specifically to meet the needs of call centers. Consumers hold globalized corporations accountable to minimum working standards, which certainly applies to call centers. Informed consumers will outcry at gross human rights infractions, and will boycott and mount campaigns against corporations that they know carry out these types of business practices. We can see cases of this constantly; Nike is a well-known example. Nike now is working to improve its standards in foreign factories, and has also opened up a foundation to reinvest in the developing countries from which their goods come. Whatever the motivations were behind these changes, these are positive strides. Siblings from a Mayan family fishing off the muelle. I am a cultural anthropologist. I am incredibly concerned with cultural and linguistic preservation. Intuitively, then, I should be against globalization. As globalization occurs, indigenous cultures and languages tend to disappear. Whether they want to or whether it’s forced upon them, indigenous peoples adopt Westernized culture and practices when they are introduced almost across the board. This often comes with disastrous consequences, such as the death of indigenous languages as national languages are adopted in order to communicate on a larger scale, or the ubiquitous litter of junk foods and beverages as convenience foods become the norm. It is incredibly hard for me to see the type of affluence that I saw around Lake Atitlán. Most Guatemalans will never attain this type of wealth. It seems almost like a taunt to bring this type of outside wealth into an area that has been so economically depressed. This seems especially so given that Guatemala is, relative to the developing world, not a poor country. 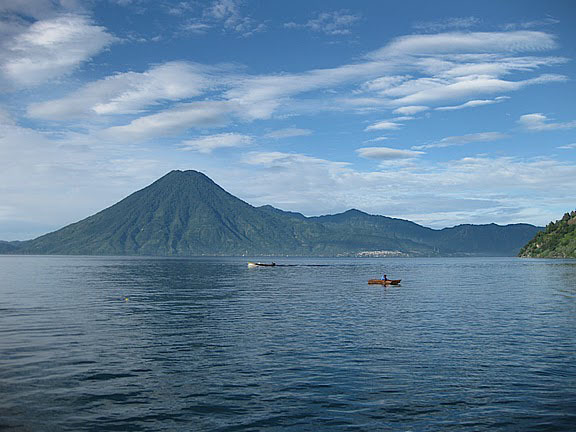 Guatemalans are poor because the resources are incredibly unevenly distributed. At first blush, this seems like a slap in the face to economically poor Guatemalans, especially due to the fact that so many of the local economic resources leave the country in the hands of foreigners and foreign enterprise. However, the individuals who own these mansions provide jobs. These jobs are often a lot higher paid and provide better conditions than the average job available in Guatemala, as described above. Doesn’t it behoove Guatemalans, then, to have foreigners coming in and bringing their money with them? In all honesty, I don’t know. I feel very torn about it. I don’t think that the kind of money brought in by foreign residents in this way is sustainable, and it certainly isn’t a large-scale solution. In order for large-scale development to take place, adoption of Western practices and ideology is almost necessary, as indigenous culture and technological development often stand in direct opposition to one another. Therefore, the push is often for indigenous peoples to become more Westernized in the name of development. I definitely don’t see Westernization as the answer. I think we lose a tremendous amount of wealth as we become more culturally and linguistically homogenized. This wealth, I feel, is ever more precious than material wealth. However, we can’t negate the call to fulfill the basic needs of people in developing countries. Ironically, this need often exists precisely because people have not adopted Western practices and ideologies. But, the stark reality is the more people have, the more they desire. Getting to the point of having enough rarely turns out to be enough. How do we develop and distribute resources without feeding the slippery slope of greed? Development is good and necessary, but I shudder to think of the consequences of worldwide consumerism. Unfortunately, it seems by introducing the one, the other follows. I’m learning to question what I intuitively “should” believe. I’m learning to look at the facts to formulate my opinions, even if that might go against previously held ideas. And, I’m learning that it’s okay to change my mind, or to not even be able to make up my mind at all. I’m becoming comfortable with the fact that asking questions usually leads to many more questions. Sometimes things aren’t what they appear to be. And more often than not there is no clear or easy answer. 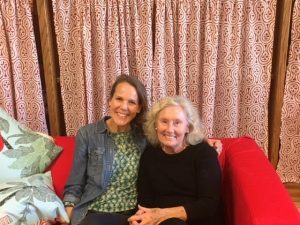 This week I saw peace in challenging what I “should” believe.